I’ve been attending quite a few more meetings than usual recently. All of them related to my PhD dissertation, and all of them require me to take copious notes. Until recently, I had been using a Life Noble Report A4 pad, but I’m starting to run low on sheets, and my nightmare would be to run short on paper mid-meeting. I love their thank you cards, and I’m beginning to build quite a collection. I needed an A4 pad, and since they were out of stock of my favorite Life pads, I had to look elsewhere. I wanted lined paper, and whilst I love the Life brand’s off-white/beige, I wanted to try a crisp, clean white for a change. Also, I didn’t want a printed margin down one side. 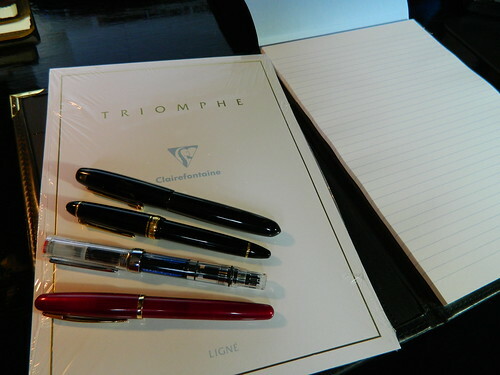 This didn’t actually leave many choices, but happily, the Clairefontaine Triomphe A4 pad was one. 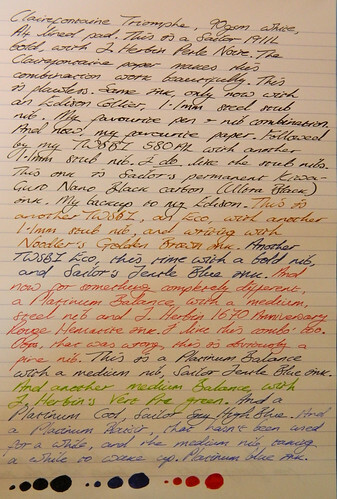 I tested the paper with several fountain pens, a rollerball, some gel pens, and a Sharpie. All of them wrote beautifully on this paper. Okay, so Susan Pigott liked it, what about the ever-excellent Azizah Asgarali over on Gourmet Pens? 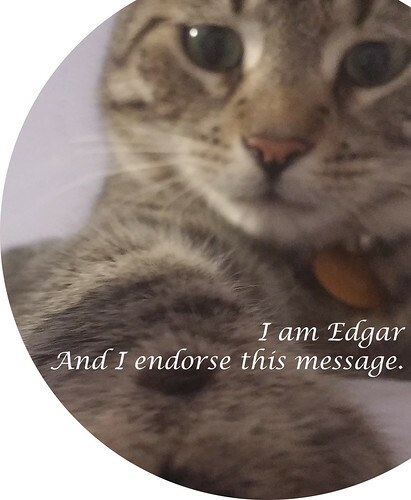 Azizah has never given me bad stationery advice—and she likes cats, so she must be trustworthy. The paper is where the Triomphe really shines. Extra white 90g acid free and pH netural with an exceptionally smooth finish. 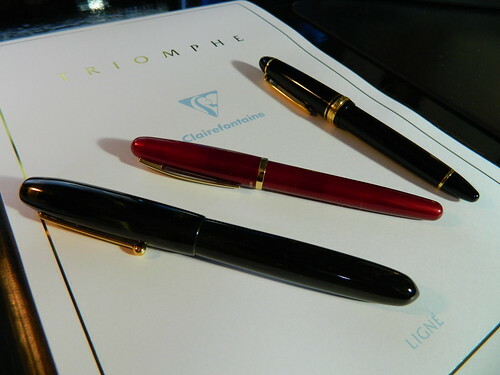 The Clairfontaine sourced paper in many products has many fans and the only detractors I find is a slightly longer dry time and cost. Both I can accept in return for the experience the Triomphe rewards with. Sounds good so far, my only problem was the size of the pad. Not the A4 size, but the number of sheets… only 50 at a time; so I bought two. What can I say that hasn’t been said? 50 sheets of nice, clean, lined, white 90gsm paper per pad. The paper is pH neutral, so it can be used for long-term storage. The pads come in a tight shrink-wrap, which keeps them fairly well protected. 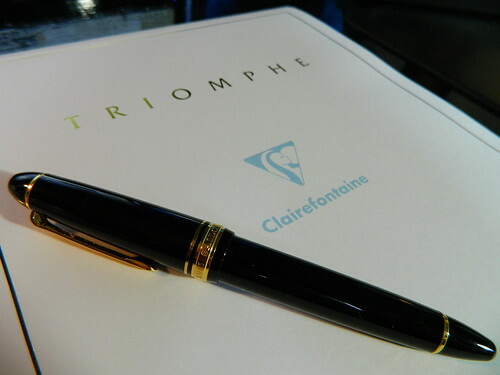 Each pad is backed by a thin card, with a tasteful, white cover, with the Triomphe name and Clairefontaine logo on the front. The card on the back is pretty flimsy, and doesn’t offer much in the way of support for writing on the move; especially for something A4 sized. This isn’t so much of a problem for me, since I routinely carry these pads in a leather folder. And the 50-sheet capacity isn’t so bad either, since this just cuts down on the weight of my bag. But if you’re buying the plain A4 (once again, this one is lined—my preference), and want to do some sketch work on the move, well, I wouldn’t use this without some kind of additional support. 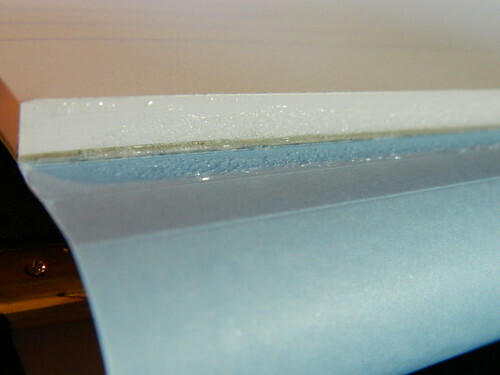 The binding makes each sheet easily detachable from the main pad. Which brings us to, what’s the paper like to write on? I tried pretty much every combination of ink and nib I had to hand, and the Triomphe handled them all beautifully, with only two caveats. Drying time can be a long wait. All of the inks I tested, with all of the nibs (including the fine ones), had a dry time of between 30 and 40 seconds. To be honest, after 40 seconds, I just used a sheet of blotting paper to set the ink and carried on writing. 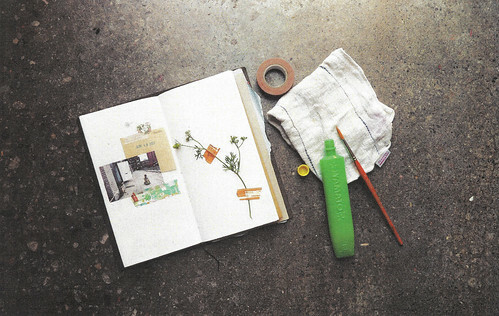 I’m not waiting a full minute to turn a page for any ink, no matter how fancy it looks. Bleed through, on the heavy spots of ink—at the bottom of the picture above—was evident. It wasn’t excessive, and wouldn’t really make writing on the reverse of the sheet a problem, but it definitely happens when using a lot of ink. The picture below, shows the reverse of the writing sample, and where the heavy ink spots have bled through. This clearly isn’t a problem for using both sides of the sheet in a normal manner. These ink spots were excessive, and the Clairefontaine 90gsm paper still performed better than the Life A4 Noble Report paper under similar use. Two, 50-sheet, pads of the Clairefontaine Triomphe A4 paper, still worked out cheaper than one 100-sheet pad of the Life Noble Report (though not by much). The Clairefontaine also performed better in terms of bleed-through, although all inks took longer to dry on its shiny surface. It’s lighter to carry around than the Life A4 pad, but that’s by virtue of having half the paper, and a rather flimsy card as the rear cover. I like the Clairefontaine, but even given all of the above, I prefer the Life Noble Report. I think it’s the off-white color of the paper, and the overall product (cover, drying time, shade of the paper, and 100 sheets in a pad). There’s something about the Life pad that I can’t quite put my finger on, I’ll be buying another one when they’re in stock again, but until then, the Clairefontaine is a great back-up and a pleasure to use. Awesome to see this. This is my favorite writing paper for letters. It’s perfectly fountain-pen friendly, in my experience, albeit incredibly smooth, which can mean ultra-smooth nibs skate on it. I’ve used this for years, for letters, because, no matter what pen or ink, I can always write on both sides with no bleedthrough or showthrough. That gives me 100 pages, writing on both sides, which makes the price easier to justify. Thanks Laura! Yes, you’re right about the really smooth nibs… after that review I was playing around with my Platinum 3776 with a music nib. Wonderful for really, bold, swoopy handwriting, you can almost feel the pen running away from you.